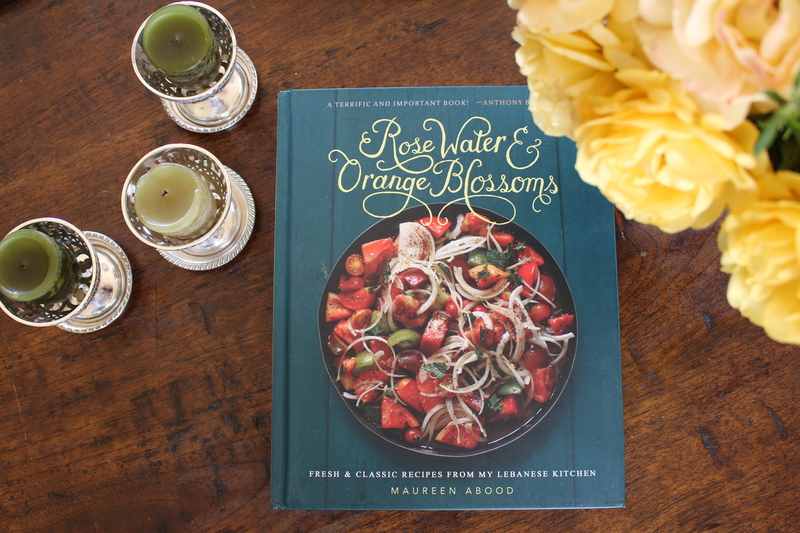 I have been checking my Amazon pre-order status for months in great anticipation of Maureen Abood’s new book, Rose Water & Orange Blossoms. And then yesterday, it finally arrived! I feel like a new mother…so excited, so proud and so wanting to share the news with the world! You would think I actually gave birth to this baby. The book baby is all Maureen’s but I had a teeny, tiny, infinitesimal role in the book in the form of recipe testing. So I can kind of claim the book like an Aunt. Well, maybe only like the friend of an Aunt but regardless, I am proud and oh-so- pleased that this baby is finally in the world. It was worth the wait. The main reason for my excitement is that I had the opportunity to try some of these recipes last year so I already know how good they are. So good. I couldn’t share the recipes with anyone until the book came out so it has been a very looong wait because every person I invited to taste the dishes I tested, wanted the recipes. And I wanted to get MORE of Maureen’s recipes. Maureen’s book focuses on her Lebanese heritage and the recipes she developed and collected from her extended family of cooks in home kitchens both here and on her life-changing trip to Lebanon, a place she had never been until recently. I haven’t tasted anything like the dishes Maureen presents, and I became an instant fan of this whole new world of tastes and flavors she offers. Just try this recipe for Eggplant with Lamb that Maureen generously agreed to share with my friends via a pdf of the actual book copy. I promise you will be running out to find her book before dinner is over. Or you can just head to her blog for links to buy it right now. And after you buy it, go straight to the recipe for Warm Dates with Almonds and Lime Zest for your next taste sensation. I hope you don’t think I am using you to promote a friends cookbook. Because if you are…guess what? She isn’t a childhood friend of mine that I want to help out. I have never met Maureen! I got connected to her by a friend when Maureen was looking for recipe testers, so I volunteered. That’s it. But just to be completely transparent, for my tiny spec of a contribution, of which I thoroughly enjoyed every single minute, she listed my name in her book!!! I nearly fell over when I saw it. This incredible culinary delight has my name in it. So in addition to Maureen being incredibly talented and willing to trust a stranger with her coveted recipes, I think she must also be an incredibly nice and generous person. Eggplant with Lamb, Tomato and Pine Nuts, Maureen Abood offered with permission from Maureen Abood. Cynthia, you are so special and wonderful! Thank you for sharing this labor of love with everyone here, and for your huge generosity and help (it wasn’t teensy weensy! It was a HUGE help!) testing recipes. I’m honored–and so happy to hear you love the recipes as much as I do. So delicious and a pleasure to make and share! It was my absolute honor Maureen. I’ve only just begun sharing the joy of your book!